An extremely rare pattern in Carnival. 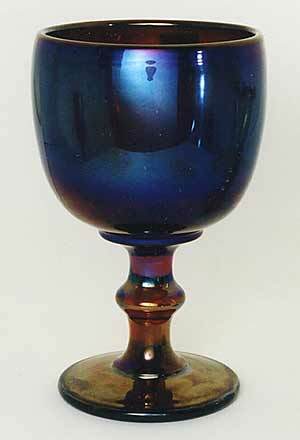 Carl O. Burns reports in his 1996 book on Imperial that this goblet was also made by U.S. Glass, McKee and Federal as well as Imperial–who made the iridized versions on a reddish amber glass. This is the only example that has sold at auction in more than twenty years. It sold in 1998 for $375. 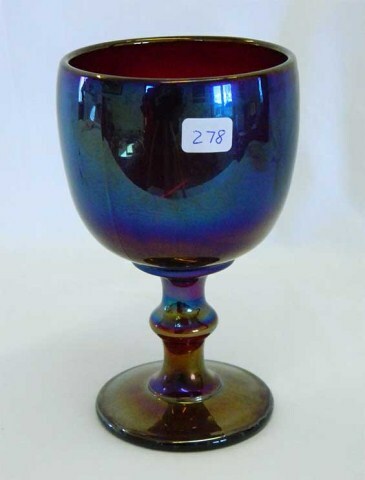 Finally, in 2013, another of these rare goblets (or perhaps the same one), sold for $650.